The New Hampton has been designed with luxury and comfort in mind. 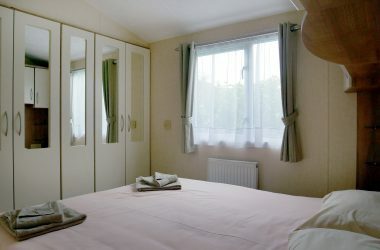 Stylish and modern, its light and airy design gives you a real sense of space. The kitchen is a real pleasure to use, and the full-size fridge freezer is a real bonus – who wants to keep food shopping on holiday? In the living room, there’s plenty of comfortable seating, and the contemporary-style electric fire ensures year-round cosiness. 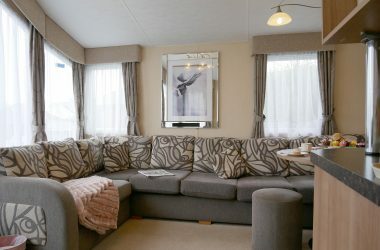 The well-designed bedrooms have stylish decor and mood lighting, giving you a relaxing haven on your busy holiday… A superb choice of caravan if you love a touch of luxury. Ayr Holiday Park is the only campsite in St Ives itself, so you can leave your car behind and stroll to the beaches, harbour and winding streets of this pretty little town. The South West Coast Path is on your caravan doorstep, so you’re just minutes away from spectacular clifftop scenery. Next door is our sister company hotel, the famous Garrack Hotel. 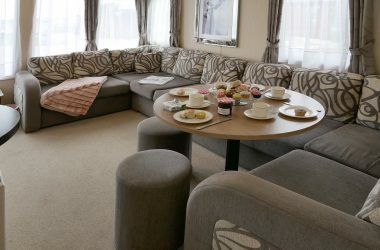 Ayr Holiday Park guests can have a dip in the indoor swimming pool (for a small cost), and tuck into fantastic Cornish produce in the restaurant or café bar with its great views.